My late wife and I, bought and established Villa Sermin as our Home in the sun. My current partner and I use the Villa as our home for 4/5months per year. The Villa is maintained to high quality and fully equipped as a comfortable home, not a holiday let. Split level lounge, lower lounge with three and four seater sofas with satellite SmartTV and DVD player, upper lounge ottaman style reading and games area and CD player. The fitted modern kitchen with granite worktop has a new cooker,dishwasher and fridge/freezer, and is equipped to enable those that enjoy cooking to use the excellent local produce and enjoy dining on their own sea view terrace. Notes on accommodation: The Villa is in a fully paved quiet cul de sac and has an attractive landscaped garden with car parking facility. Outside: A mature garden leading to the pool area. Large private freshwater pool 3.9 x 8.5m - Depth 1.5m, with child friendly steps down into it. Surrounding patio area with sunloungers tables and umbrellas. Fully equipped, poolside, Summer kitchen,with shaded dining area,fridge and barbecue etc. Utility Room: Automatic washing machine, iron and ironing board. Cleaning / Towels / Linen / Maid service: The villa is lightly cleaned weekly with towels and bed linen being changed. As luggage allowances are being reduced by most airlines Pool/beach towels are supplied. Other: Large kitchen terrace with barbeque and dining table and chairs. Large lower terrace,wih seating and steps leading to 3.9m x 8.5m fresh water pool. Pool depth 1.5m. Equipped with poolside furniture. Fully eqipped poolside Kitchen with shaded eating area. This was certainly one of the best villas we have stayed in, and definitely surpassed others we have stayed at in Kalkan. It is extremely well equipped, with everything you could possibly need. It was well very maintained and the cleanliness fantastic. The views from the terrace leading from the kitchen could not be beaten and the Kalamar area of Kalkan where the villa is situated is lovely, and very peaceful. William the owner even called us the day after we arrived to check all was okay. We have never experienced that before, it was much appreciated. We have no complaints whatsoever and would thoroughly recommend a stay here. I would like to thank Michaela and Chris for such a lovely review and I am very pleased that they enjoyed their stay in Villa Sermin and Kalkan. 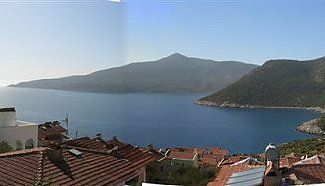 1.6km from Kalkan Village and 1.9km from Kalkan Harbour. 250m to Kalamar Bay beach club. Half an hour by car or local bus to Patara Beach (considered one of the best beaches in the world by The Sunday Times travel writer). One and a half hours from Dalaman airport. Three hours from Anatalya airport. Transfers and car hire can be arranged if required. Dolmus service into Kalkan from Kalamar (10am,1 and 7pm). Many places of natural beauty and historical interest. Lycian Way, Saklikent Gorge, Kekova sunken city, Tlos, Xanthos, Letoon, Pinara are all within easy reach. Kalkan is a beautiful village nestling on the edge of the Toros Mountains. In Kalkan there are many wonderful restaurants offering a wide variety of dishes at more than reasonable prices. Shopping is a delight in the small boutiques that line the cobbled streets. Diving, snorkelling and canoeing are all available locally. There are a variety of boat trips available daily from Kalkan harbour. Booking Notes: £100 per week, non refundable deposit on booking, balance ,non refundable, to be paid 8 weeks prior to departure. Changeover Day: Changeover is flexible. Property to be vacated by 10am.